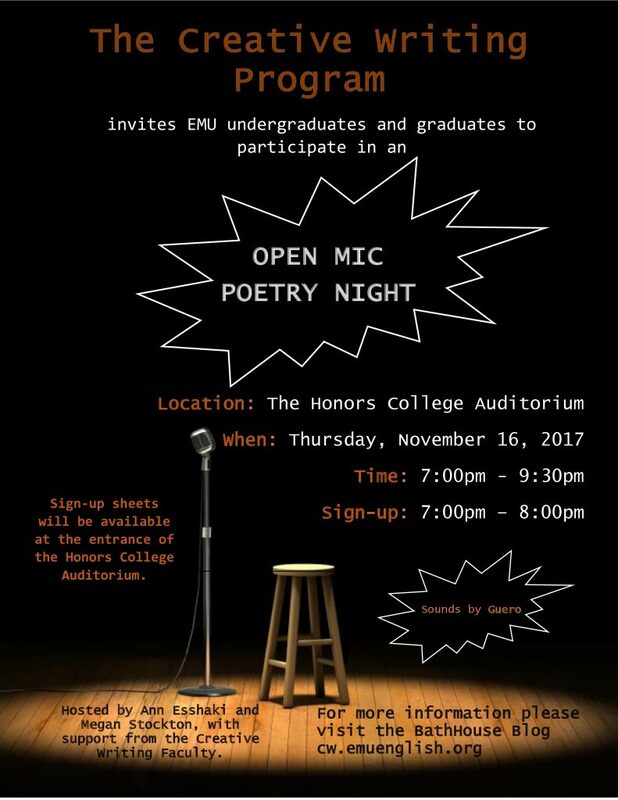 The Creative Writing Program is hosting an Open Mic Poetry Night in the Honor’s College Auditorium on Thursday, November 16, 2017 from 7:00pm – 9:30pm. Sign-up sheets will be made available near the entrance of the Honor’s College Auditorium. The open mic sheet will be available from 7:00pm – 8:00pm. Please arrive early to ensure a spot on the open mic list. The mic will open at 8:00pm. Also, there will be a Creative Writing Student Organization sheet available for those interested in receiving more information about joining the organization. The event is FREE to attend and open to ALL undergraduate and graduate students.